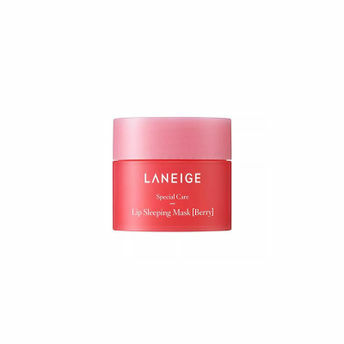 The Lip Sleeping Mask by Laneige gently melts away dead skin cells from the lips, making the lips feel smooth and elastic. Experience smooth firming lip night care with the new lip sleeping pack. Berry extracts being rich in vitamin C and antioxidants act on dry, rough lips, making them smooth and supple. Laneige's patented moisture technology puts active ingredients such as hydro ion mineral water, evening primrose root extract, and hunza apricot extract in the dense beta-glucan moisture film (network). It helps skin absorb the ingredients densely into skin during 8 hours of sleep. - This product is dermatologist tested. The brand does not test ingredients or products on animals. About the Brand: With dedication and expertise in moisture research, LANEIGE has discovered the secrets of sparkling beauty from water and completed the water recipe for individual skin types. Presenting hydration-packed products combined with cutting edge water technology that deliver glowing skin and sparkling beauty for trendy, confident women. These products are developed to address the different skin concerns of women losing their vitality due to stress and hazardous environment, LANEIGE water will be a solution that awakens your skin's potentials. Explore the entire range of Lip Masks available on Nykaa. Shop more LANEIGE products here.You can browse through the complete world of LANEIGE Lip Masks .